Which dogs get liver shunts? Any dog can develop an acquired shunt(s) from liver disease. Similarly any dog can be born with a congenital shunt, but some breeds are over-represented for this birth defect. Small and toy breed dogs typically have extra-hepatic liver shunts, while large breed dogs more often have intra-hepatic ones. 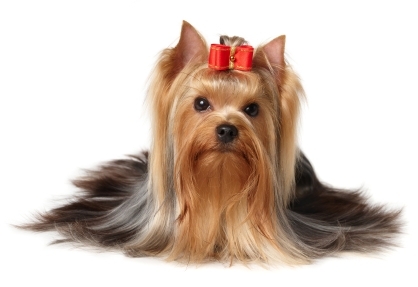 Yorkshire terriers are at more than 35 times the risk of developing a liver shunt compared to all breeds combined in the United States. 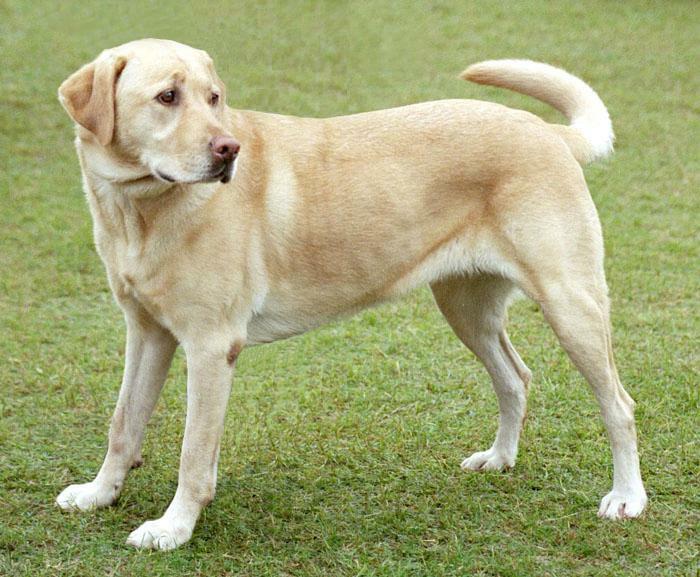 Labrador Retrievers are over-represented for intra-hepatic liver shunts in the United States. Liver shunts are hereditary in Yorkshire terriers, Irish Wolfhounds, Cocker spaniels, and Maltese, and are suspected to be hereditary is several other breeds. Dogs with liver shunts should be castrated or spayed, and the parents of the affected animal should also not be bred. The neurologic and behavioral changes are the result of the accumulation of toxins and metabolic waste products in the bloodstream. Cumulatively these chemicals cause a syndrome called hepatic encephalopathy. To learn more about this syndrome, click here. One of the most important diagnostic tests for any pet with a health concern is providing your pet’s veterinarian with an accurate and thorough history. Does your dog drink a lot of water? Has it been difficult to house-train him/her? What information can you provide about your dog’s littermates? Have you observed any behavioral changes? Bile acids: Bile acids are made by the liver and subsequently stored in the gallbladder. When a dog eats a meal, the bile acids are expelled from the gallbladder into the small intestines to help digest fat before they are reabsorbed and stored until the next meal. Bile acid levels are elevated in patients with liver shunts because the liver is not able to remove them from the blood for storage in the gallbladder. Abdominal ultrasonography: An experienced ultrasonographer (either a board-certified veterinary radiologist or internal medicine specialist) may be able to visualize a liver shunt using a special sonographic technique that detects blood flow (called Doppler flow). However shunts can be easily missed, and thus if ultrasonography does not identify a liver shunt, this doesn’t mean a shunt has been 100% ruled out. Computed tomography with angiography: This is a medical imaging technique that uses a CT scan and a special contrast agent/dye that is injected into a vein (called angiography). The contrast material travels throughout the circulatory system, including through a liver shunt, and multiple images are captured with the CT scan. This procedure is quite helpful, providing both diagnostic information and images that are helpful for planning surgical intervention. This is a specialized procedure that requires a brief period of anesthesia, and is frequently only available at veterinary specialty hospitals. Portography: This is a radiograph (x-ray) taken of the blood vessels traveling to the liver after they are injected with a special contrast agent. This imaging test is most commonly performed via an injection directly into a blood vessel in the abdominal cavity, through a special catheter in a vein in the neck, or through an injection into the spleen. This procedure should be performed under the guidance of a board-certified veterinary surgeon, internal medicine specialist and/or radiologist, and does require sedation/anesthesia. Dogs with liver shunts initially receive various medications and a special diet to help treat clinical signs associated with hepatic encephalopathy. Consultation with a board-certified internal medicine specialist will likely be helpful in developing the most appropriate treatment plan for an affected pet. Most patients improve very quickly, and approximately 33% can live a high-quality life for a reasonably long period of time. Unfortunately more than 50% of dogs who only receive medical therapies are euthanized within 1 year of diagnosis due to uncontrollable neurologic signs. An ameroid constrictor placed around an extra-hepatic liver shunt. Photo courtesy of the University of Sydney. Consultation with a board-certified veterinary surgeon is strongly recommended to determine the most appropriate surgical technique for addressing an extra-hepatic liver shunt. Intra-hepatic shunts historically have also been treated surgically, but this type of procedure is more invasive than that required for correcting extra-hepatic shunts. More recently the use of interventional radiology to place special coils inside an intra-hepatic shunt (called transvenous coil embolization) has been advocated, and is available at several veterinary specialty centers in the country. 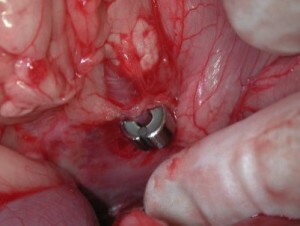 Click here to see a video this procedure. After surgery, patients require hospitalization and around-the-clock monitoring for a few days. They are at-risk for developing low blood sugar post-operatively, and must be examined serially to assess their comfort level. A small percentage of patients will have post-operative seizures that require intervention. Rarely patients develop complications (i.e. : portal hypertension) that can be life threatening. More than 95% of patients with extra-hepatic liver shunts that are surgically corrected with ameroid constrictors survive, and the vast majority are clinically normal within 1-2 months of surgery. Special diet and medical therapies for hepatic encephalopathy can frequently be weaned over 2-8 weeks, and liver function dramatically improves (and possibly normalizes) within 6 months of surgery. While 85% of patients treated with an ameroid constrictor clinically do very well, roughly 15% have residual clinical signs. This is likely due to the presence of minute blood vessels within the liver tissue; these patients will require medical therapy and a special diet for life. Liver shunts are complex anatomical abnormalities common in many breeds of dogs. Special diagnostic tests are needed to definitively diagnose this condition, and consultation with a board-certified veterinary internal medicine specialist can be helpful. Ultimately surgery affords patients the best opportunity to lead the highest possible quality of life for as long as possible, and thus consultation with a board-certified veterinary surgeon is strongly recommended once clinical signs of hepatic encephalopathy have been appropriately controlled. To find a board-certified veterinary radiologist, please visit the American College of Veterinary Radiology.